My name is John Trautwein and it was great to be a part of the NU/Wake weekend that was just completed. It was my son Michael who was in your dugout yesterday, and I wanted to take the time to thank you boys for what you did to really improve a young boy’s life! You may or may not be aware, but Michael’s oldest brother, Will Trautwein, took his own life on October 15th, 2010 – some 4.5 months ago. Coach Stevens, one of my “Life Teammates” was at the funeral for Will. Will was 15, a freshman in high school, 6’1″, 165lb strapping, and good looking young man. He was a star Lacrosse player, an excellent guitar player and musician with his own band… a good student – a popular kid with tons of friends. He loved everyone and was loved by everyone, perhaps mostly by his brothers (Tommy (13), Michael (11) and his sister Holyn (6). Not a day has gone by since that tragic morning that my family has not broken down in tears and sorrow over the loss of our beloved son and brother. Yet somehow, every day, we are shown an unbelievable amount of love and support that gives us the “Will” to continue living our lives and finding the “good” that does indeed exist – every single day. We don’t know why, we just know on that night/morning he lost the “Will to Live”… as a result, we have formed a foundation called “The Will To Live Foundation” that is dedicated to working with and through teens and young adults to help spread the awful message that teen suicide is an epidemic in America… in fact, as a type this note, someone in America is taking their own life. www.will-to-live.org is the website for the foundation. As you can imagine, the foundation is making a positive out of a tragedy, and that gives me strength, but really, for Michael, it is just this organization that he hears about…. It does not bring his hero back and is not the source of any smiles for an 11 year old boy. Yesterday, boys, you were the source of a thousand smiles as you took over that role of hero. You were kind to him, you were outgoing, you were friendly, you were sincere, you were funny, you were interested… quite simply – you showed him love – and I cannot thank you enough. The whole 4.5 hour drive back to Atlanta Michael was reading the “roster” circling the names of the guys who he spoke with and who did what and who said what… “Dad, they were so nice to me… I couldn’t believe it. Tommy (his 13 year old brother) should have been there – he would have loved it… and boy can they mash”…. The smiles that highlighted Michael’s face throughout the day were so wonderful and something I have not seen from Michael in a long time. You all did a great thing yesterday… You played well, you fielded will, you pitched well – you had one tough inning… you hit rockets for outs all 9 innings… on the field you played well enough to win, but in the dugout and along the sidelines, you won a different game and in the long run, perhaps a more important game. You won the heart of a young boy – you gave him a wonderful gift – you loved him, and I’m very grateful. Boys, at my son Will’s funeral there were over a thousand people there. I gave the Eulogy, all of his teammates were there and I spoke directly to them. I spoke of how the one thing I wished for Will was being on a team, I didn’t care what kind of team, but being on a team – being with guys you share a dream with. At that funeral there were over 30 ex-teammates of mine from little league and high school football/basketball/baseball (from Barrington IL), there were a bunch from NU and a few from pro ball as well. Joe Girardi, my catcher for 2 years at NU, called me 15 minutes after the funeral which was 15 minutes before the American League Division series game was to begin – just to tell me he loved me and I was in his and his family’s prayers. My teammates, those guys who I formed “Life Friendship bonds” with when I was your age were there for me My NU teammates are the best friends in the world to me, and I’m here to tell you that your NU teammates will turn out to be your best friends as well. Paul and I coached together for a few winters during my pro-ball off seasons. We became friends, I was at his wedding, he was there for me – and is here for me now. This Will To Life Foundation encourages young adults to realize that they have “Life Teammates” already… and it is so important to “tell each other” that you’ll be there for each other. Something that I didn’t do when I was in my teens and most kids didn’t as well. 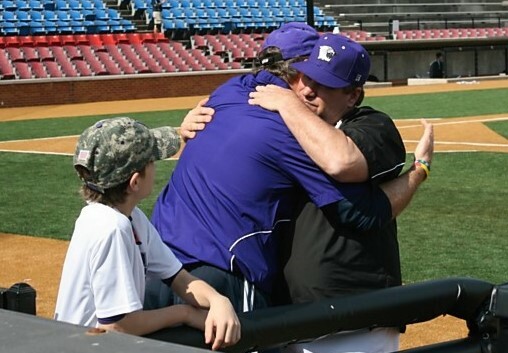 Life Teammates John Trautwein (purple) and NU Head Coach Paul Stevens demonstrate the “Love Ya Man Hug” for young Michael! Today, however, in today’s world with today’s pressures, it is vital that all of you guys tell each other you love each other and are there for each other. My son Will had so many friends that loved him dearly – So many, but until now, they didn’t really know how much they loved each other, and the result is an empty bedroom at the top of our stairs that young Michael has to walk by each day. “Good teams win, but Great teams love each other” is my latest quote that I’m saying all the time to teams that I’m asked to speak to here in Atlanta. Yesterday you showed just how great you guys are by loving my son… and I am so grateful… I now ask that you love each other … don’t win for Michael, don’t win for Will, don’t win for Coach Stevens and don’t win for yourself… WIN FOR EACH OTHER! Please know I’m behind you guys and believe in you guys! 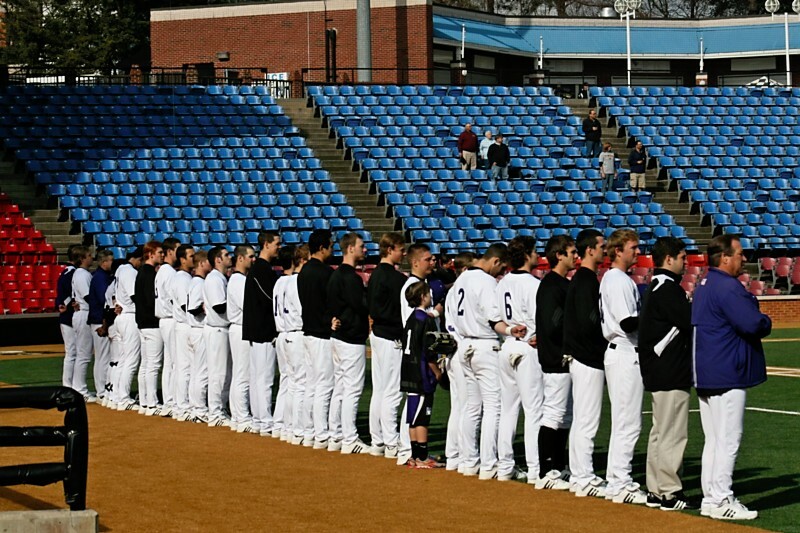 The future at NU is strong and you guys made me more proud than ever to be a part of the NU baseball family. 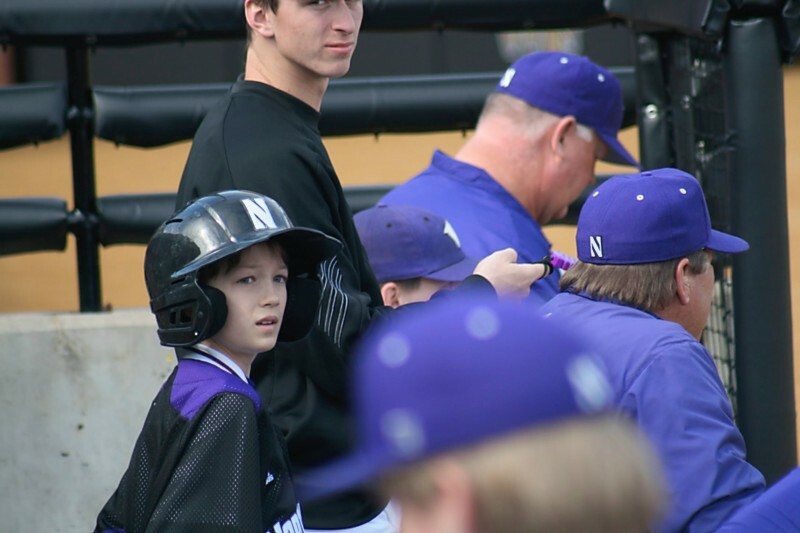 Home / WTL In The News / WTL Blogs / A Batboy’s Will To Live!